The Quiptec "Grind-Aid" provides a modern foundry cleaning room with an innovative machine to clamp, position, and rotate a large range of differing casting shapes, sizes and weights. 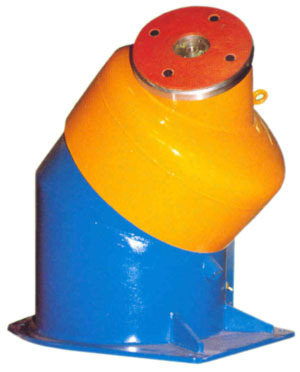 Careful attention to detail has produced a high quality, rugged machine which eliminates most of the manhandling of castings necessary during snag-grinding and cleaning operations. Two-axis positioning produces three-dimensional movement of the casting. Almost any desired position may be obtained for optimum operator efficiency. 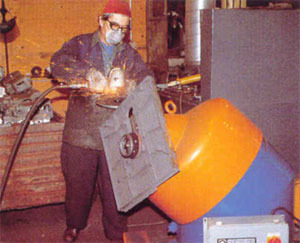 The casting is clamped on the face-plate by a spring-powered mandrel and released pneumatically, allowing for quick clamping and release. 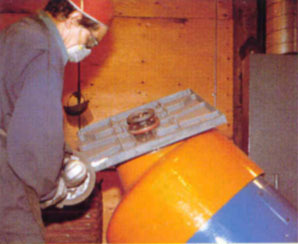 The casting is held to the faceplate with a pull force up to 4000 lbs. When special tooling for specific applications is used, the exposed faceplate with pre-machined fixing holes provides a variety of locating options. Custom engineered tooling for unique or specific user requirements is also available. Note central mandrel and quick release hand wheel for easy casting attachment and removal. The Quiptec Grind-Aid enables the work station to be used for both snag grinding and detail finishing - eliminates double handling. 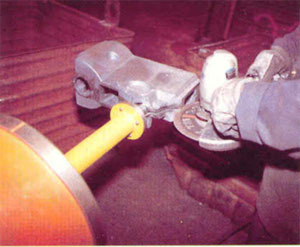 Foot controls allow operator to present casting at ideal height and position for most efficient grinding. 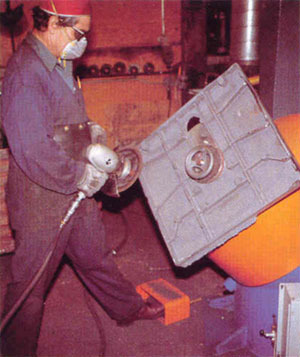 The use of special tooling allows fast clamping and access to all six sides of high production castings. 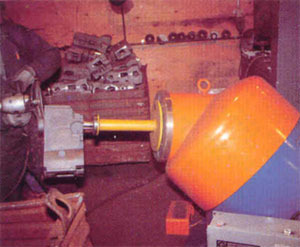 Expanding mandrel allows fast clamping of high production castings. Precise positioning allows accurate grinding of intricate details.